There are always new variations of well known games being created, but this new one takes the traditional table tennis table and splits it into four, and throws in a few rules from billiards to add another unique twist to the game. 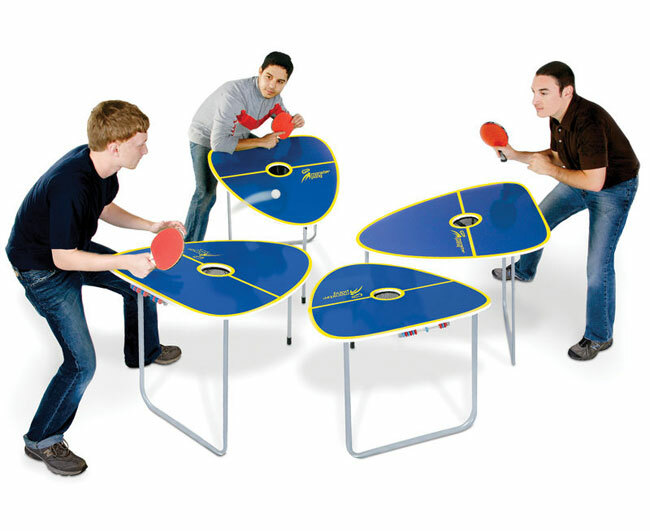 The Quad Table Tennis Game has been designed to be played by four opponents and uses four separate tables which will definitely add a little more skill to the game, but make it easier to store than a traditional tennis table. Within the game players can hit the ball onto any opposing player’s table, which are placed just a few feet apart facing one another. The table measure 24″ long x 18″ wide and are triangular in shape. The table tapers to a round point in the front; the back edge is pitched 10º, causing balls to bounce upwards towards a player. Each table has a line for serving with a hole in the middle which can be used by the server to notch up a point. The Quad Table Tennis Game is available to purchase For $250.